Many people dream of making their fortune from the wonderful ideas they dream up, or the inventions they create. Of course many people dream up ideas on a constant basis and despite lots of talk and promises never manage to achieve any return from their ideas. Turning any idea into commercial reality is an extremely difficult task to achieve. Even for large corporations many ideas never achieve commercial success. One aim of this book is to address the issues involved for a private individual or small business operator in turning ideas into commercial reality - by commercial reality we mean making money and obtaining a realistic return on investment. 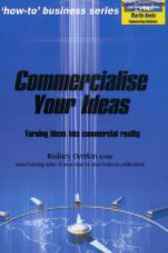 We look at a number of areas concerned with commercialising ideas. Perhaps you can patent your idea and sell the intellectual property all around the world? Other people may choose to manufacture the product or provide the service themselves and create a business in order to do so. We also consider the issues involved in identifying, evaluating and working with potential investors who may have an interest in funding the commercialisation of your idea - commonly known as Business Angels or Venture Capitalists. There are many successful stories of ideas being backed by these types of people and being very successful through an Initial Public Offering (IPO) on the stock exchange. However for every one hundred ideas submitted to Business Angels only one or two will be accepted for development. Business Angels and Venture Capitalists are becoming a significant force in the Australian business environment and business economy. Because of losses suffered in recent downturns in the business cycle - first the recession in the early 1990’s and then the e-commerce shake-out in 2000 (Business Angels and Venture Capitalists suffered more than most) - Business Angels will have many strict considerations for any product or idea which they consider backing. Another aim of this book is to explain and identify a range of issues which a business person or entrepreneur will need to address in order to identify a suitable Business Angel or Venture capitalist willing to invest in their business. Some of the key issues include understanding equity investment, identifying where debt and equity finance can be accessed, identifying what assistance may be available from governments, and the issues involved in working with a Business Angel. We also look at the key issue of being investment ready, preparing your business for equity investment, and being able to communicate effectively - verbally and on paper - with potential Business Angels. These are areas where most people seeking investors for their business fall well short of the expectations and requirements of potential investors. A further important and key issue is formulating exit strategies, a key issue which needs careful attention from both sides, investor and investee, to ensure that at an agreed time or cycle a clear strategy exists to enable the investor to exit with a profit and for the business to continue on with its planned growth and expansion. Finally as proof that the business environment is both dynamic and difficult, many of the people and companies written about here have fallen from grace and in some cases have gone into liquidation, while others such as Chris Corrigan have prospered mightily. We also have a Training Facilitator’s Manual available on this subject. For further assistance with the development of your idea, some of our other business publications may be of assistance. We welcome your comments and suggestions.